The weather in Florida has been amazing–cool and breezy. Cool as in 80 degrees, but that’s a massive improvement, and a very welcome one, from the 100 degree temperatures we were enjoying just last week. “Cool” is relative, right?! 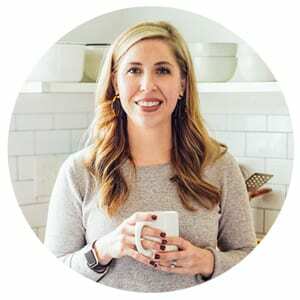 Cool weather means new food cravings (or maybe that’s a bit of Instagram’s influence ;)): creamy soups with grilled cheese sandwiches, chocolate chip cookies, and homemade lattes. But the cravings don’t end there. I’m also craving a new wardrobe. I’m ready to transition from my summer capsule wardrobe to a Florida-style fall/winter capsule. The summer capsule consisted of coordinating a few pairs of shorts, jeans, a couple of chambray shirts, a few tees, and two pairs of sandals. Now that the cooler weather is here to stay (hopefully!! ), I’m ready to break out my boxed-up fall and winter capsule. 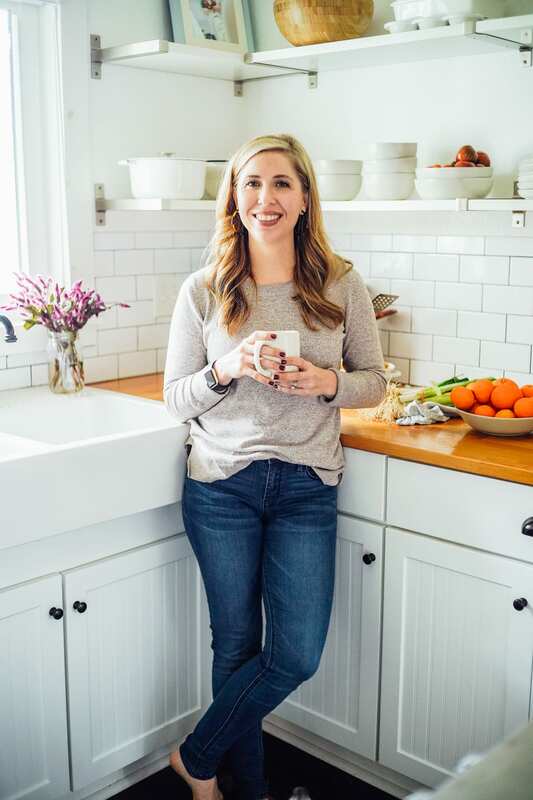 Now that I have the staples for this capsule–a few pairs of pants, and some layering shirts and cardigans–I’ve decided to only add a couple of new pieces that I feel my capsule was missing last year, especially in Florida. One of these items is a long sleeve, lightweight shirt that can transition from mom life to the occasional professional setting. The other item is a pair of Lucky Booties. I had these on my capsule wish list last year. Since we don’t wear boots in Florida (oh how I wish), booties are the non-sweating solution. Plus, those boots have Joanna Gaines written all over them, which must mean that my cool factor is majorly amplified when wearing them. Okay, okay. That’s enough about clothes, at least for one day. You came here today for soup, right?! 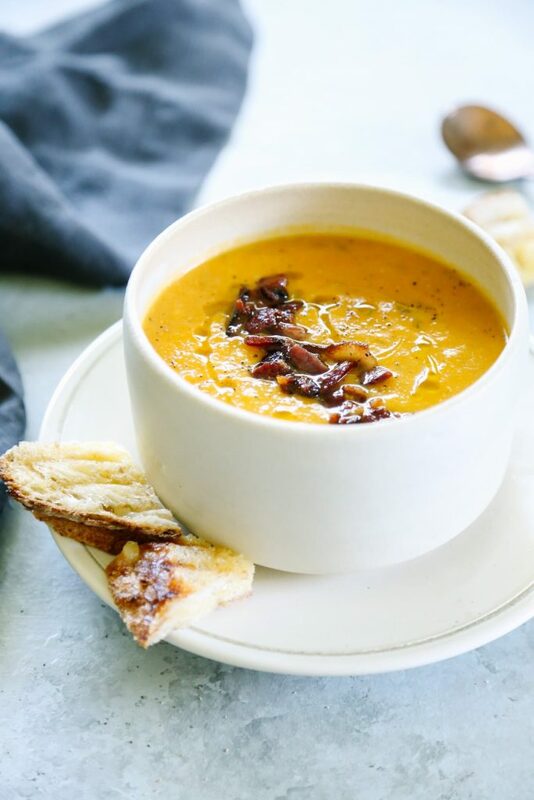 Today’s recipe, a creamy butternut squash soup, is exactly the kind of flavorful meal that I crave as we shift from the heat of the summer to the cooler days of October and November. 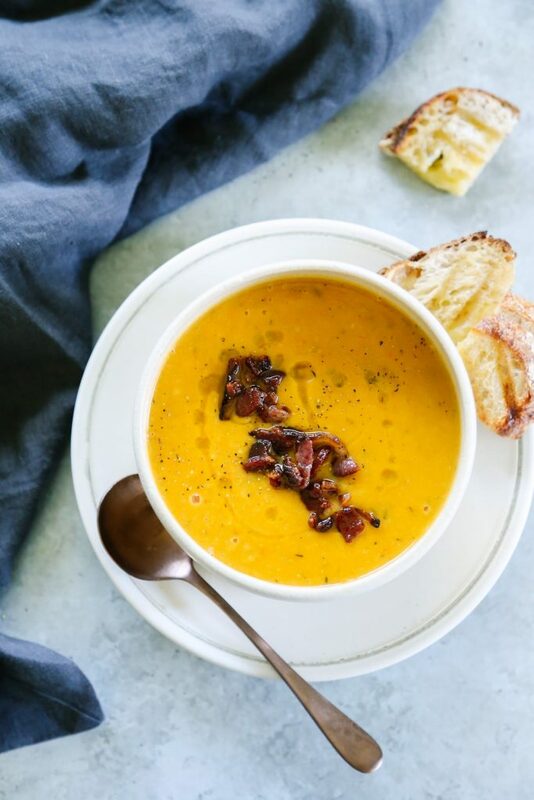 When this creamy soup is paired with a grilled cheese, there’s only one word to describe the experience: divine! And when that soup is paired with a grilled cheese, a mustard-colored cardigan, and booties…Hello, Fall!! 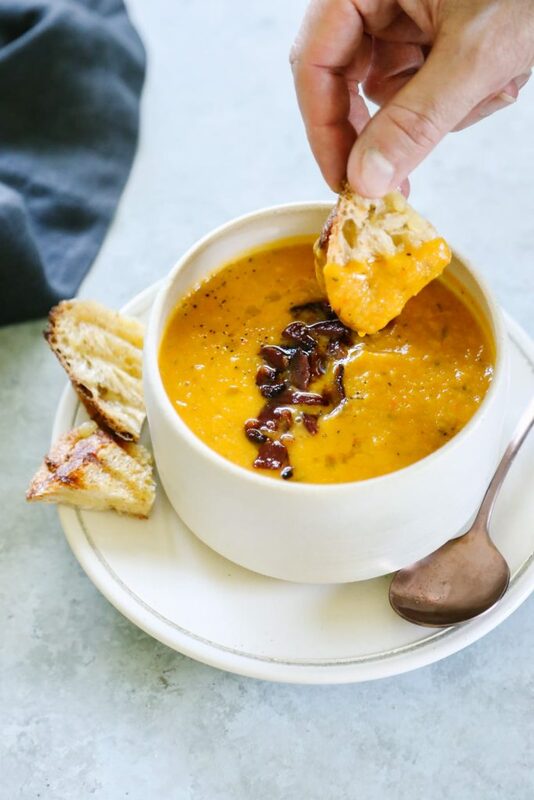 This butternut squash soup is incredibly easy to make. 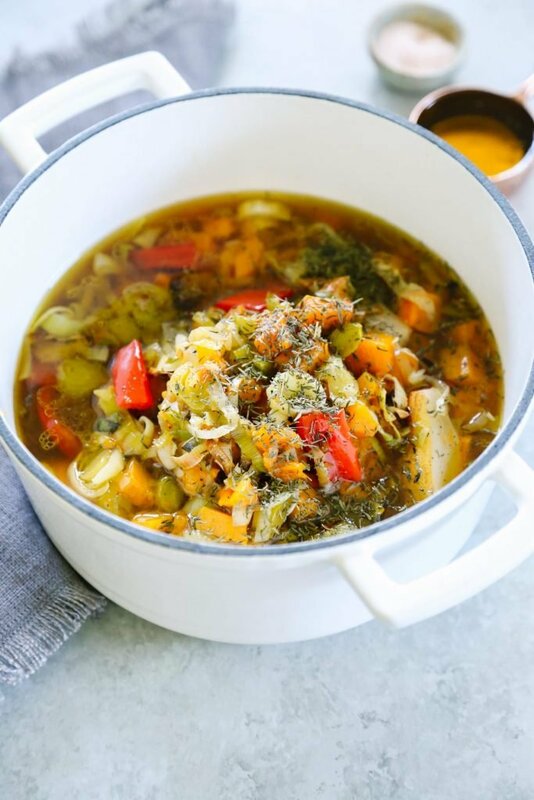 Once the veggies are chopped (which may be prepped in advance), and then roasted, they are blended with broth and olive oil to create a sweet and savory blended soup. Easy peasy! 4 garlic cloves pressed--Press on the garlic cloves with the back of a wooden spoon to crush the cloves. 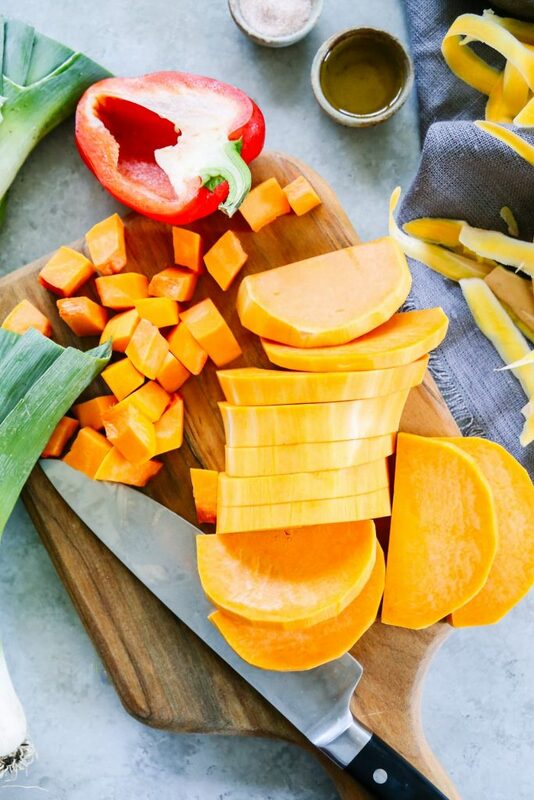 Place the vegetables and fruit (cubed squash, sliced leeks, sliced bell pepper, garlic cloves, and sliced pear) on a large high-rimmed baking sheet. Drizzle the vegetables with olive oil, and gently toss to combine. Sprinkle the veggies with the salt and pepper. Roast the vegetables, uncovered, until tender--about 40 minutes. Around the 25 minute mark, I recommend checking on the veggies, and stirring them if the leeks (or another veggie) appear to be browning quickly. Once the veggies are roasted, place them in a Dutch oven (or soup pot), along with the chicken broth and thyme. Heat the broth and veggies, over medium-high heat, until the broth begins to simmer. Use an immersion blender to blend the soup until it's smooth. Remove the pot from the heat. Add the olive oil, and blend until the soup is creamy. Taste the soup and add more salt, if needed, to taste. I personally add 1/2 teaspoon of additional salt at this point--this will vary depending on the saltiness of your broth. Serve the soup warm with grilled cheese or warm bread (optional, but highly recommended). I also like to top the soup with a few bacon crumbles. The veggies may all be prepped (sliced and cubed) in advance, except the pear. 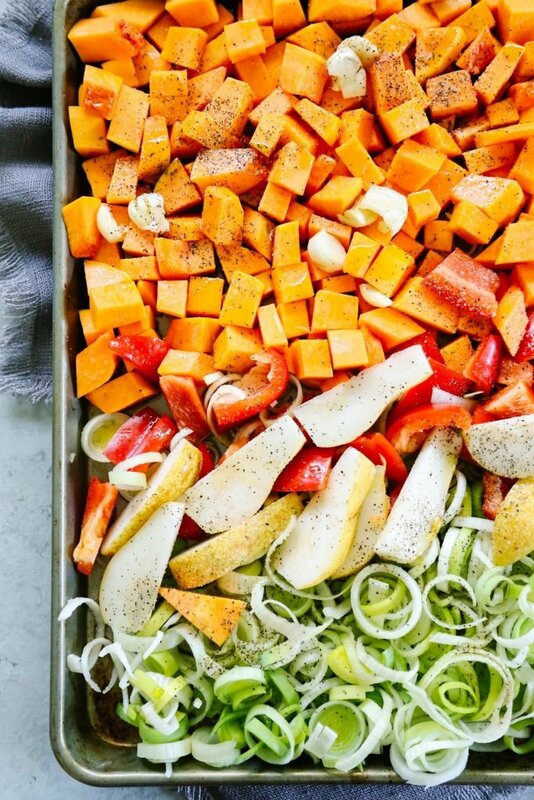 I recommend keeping the cubed and sliced veggies in the fridge up to 2-3 days before roasting. 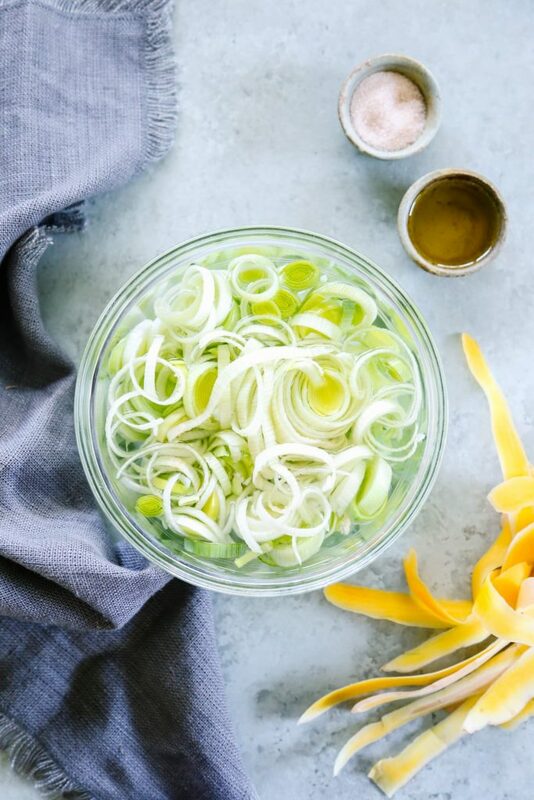 Leeks are usually very dirty, so I recommend soaking them, after they’re sliced, in a bowl of water. After a few minutes of soaking, drain the water and rinse the leeks with fresh water. I’ve been using Bartlett Pears to make this soup, but I think any pear variety will work well. I’ve left the olive oil amount, for roasting, up to you. I recommend using 2 tablespoons of olive oil at first, and then if the veggies need more oil, adding an additional 1 tablespoon before roasting. Vegetable broth may be subbed for the chicken broth. The flavor of the soup just gets better with age, in my opinion, so this is an ideal meal to prep on the weekend and enjoy throughout the week for lunch, or freezer for later. Okay. So I’ve honestly never read your blog, but I stumbled across this soup recipe and decided to try it out. It is possibly the best vegetarian soup I’ve ever had (I used veggie broth instead of chicken). I meant to meal prep it, but I’ve been eating it out of the Dutch oven with a spoon. The olive oil really takes it to the next level! Thank you so much for this incredible recipe! Hey Jo, That’s so great to hear! I’m so glad you’re in love with this soup–it’s been my obsession lately. Enjoy!! 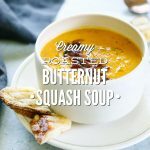 I have had butternut squash soup once at a fancy lunch I went to once…I don’t know if any of my guys would eat it…my oldest may try it…how much do you say this makes…it may work for me through out the week since I love soup…do you just refrigerate it and heat up or divide in single servings? Hey Maggie, My guys like to dip sandwiches in this soup. So maybe the dipping idea may help :)? This soup will make about 6 cups. You can add a bit more broth to make more, and thin the soup. I usually keep the soup in a large container, and then pour the amount needed for lunch in a bowl and reheat the small amount. You could also put the soup individual mason jars or containers for a grab-n-reheat option. I made this and added some cooked red lentils at the end to give it a little more staying power. Turned out great! That’s such a great idea, Jenny! Thank you for sharing. I’m going to try the lentils next time, too. OMG! I made this soup for dinner last night. It was amazing. I just finished up leftovers for lunch today and yes, it tasted even better today. The bacon on top was key. 🙂 Thanks for the great (and easy) recipe! That’s so great to hear, Ellen! I’m so glad you enjoyed the soup. I agree, the bacon is key ;). I know it has been awhile since this soup was posted. But we had it for dinner tonight and I wanted to let you know it was a hit!! At first my husband was somewhat dubious, but he liked it! I will definitely make it again. That was the first I ever purchased leeks. I must try your leek and potato soup.Thank you. That’s so great to hear, Virginia! Thank you for coming back and sharing. Leeks are so delicious. I think you’ll love the leek and potato soup. I haven’t tried this yummy-looking recipe yet, but hope to do so this weekend after a grocery haul. Just wanted to say THANK YOU – I used to make a butternut squash soup with apple (and the only good recipes contained this ingredient). Our 16-month-old not only has a dairy allergy but apple (among others), as well. Actually, my paleo husband and newly vegetarian son would enjoy this, too! The idea that I can make one meal for the whole family’s dietary challenges makes me want to cry happy tears!